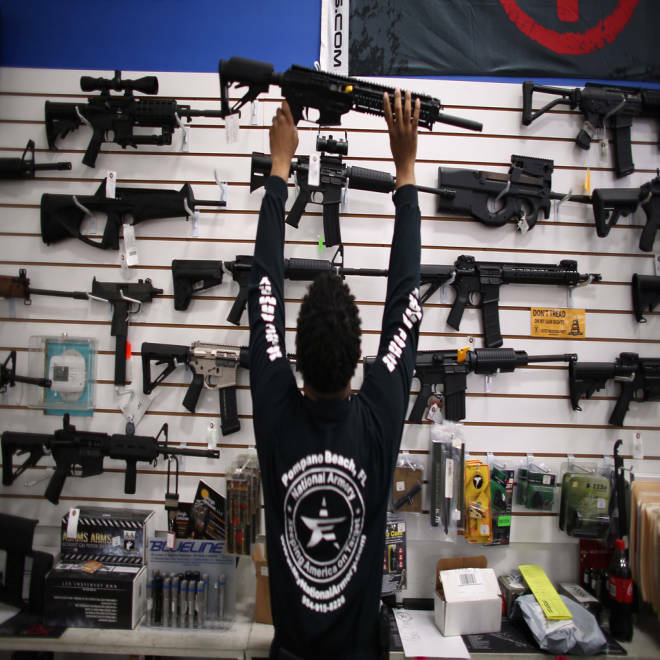 Mike Acevedo puts a weapon on display at the National Armory gun store on April 11, 2013 in Pompano Beach, Florida. The Institute of Medicine laid out a path Wednesday for research on firearms violence. Experts laid out a broad plan for firearms research on Wednesday, saying data is needed on who owns guns, where they keep them, how likely a gun is to be used to hurt someone else, whether having a gun keeps you safer, and whether there are ways to make guns any safer. The report says the statistics that can be found speak clearly to the need. “Although violent crime rates have declined in recent years, the U.S. rate of firearm-related deaths is the highest among industrialized countries. In 2010, incidents in the U.S. involving firearms injured or killed more than 105,000 Americans,” the panel of experts writes in its report. These include more than 70,000 injuries and 30,000 deaths. After several highly publicized and traumatic mass shootings, including in Aurora, Colorado in July and Newtown, Connecticut in December of last year, President Barack Obama issued 23 executive orders directing federal agencies to find out more about gun violence. Such research had been stifled since Congress started cutting the Center for Disease Control and Prevention’s injury prevention budget in the 1990s, specifically in response to firearms research. The panel met in April and heard from some of the top firearms safety researchers in the country, as well as from representatives of the National Rifle Association and other pro-gun-ownership groups. “I will say that every person who testified was in favor or collecting more fact-based information,” says Leshner, who is CEO of the American Association for the Advancement of Science. “This has nothing to do with whether people should or shouldn’t have guns. This is about finding scientific evidence that can be used by policy makers,” Leshner said. “Basic information about gun possession, acquisition, and storage is lacking. No single database captures the total number, locations, and types of firearms and firearm owners in the United States,” the report notes. Anonymous data is fine, and it might reassure gun owners if they know their names, addresses and other personal information would not be collected, the panel said. Guns-rights groups have lobbied against firearms research in large part because they fear that it will be used to justify taking guns away from legal owners. The panel says other arguments from gun owners need to be taken into account – including claims that people who own guns are safer. “Almost all national survey estimates indicate that defensive gun uses by victims are at least as common as offensive uses by criminals, with estimates of annual uses ranging from about 500,000 to more than 3 million per year,” the report reads. What needs to be sorted out is whether this is actually true, and whether accidental deaths, murders by gun owners, and suicides outweigh any lives saved by gun owners protecting themselves, the committee said. The NRA did not answer requests for interviews for this story. Any funding for the research has to come from Congress. Obama asked lawmakers to allocate $10 million for studies by the CDC and other agencies, and $20 million to expand the National Violent Death Reporting System to all 50 states. Former Arkansas Rep. Jay Dickey, who sponsored the 1996 legislation cutting CDC's firearms research budget, has since said he regrets having done so.